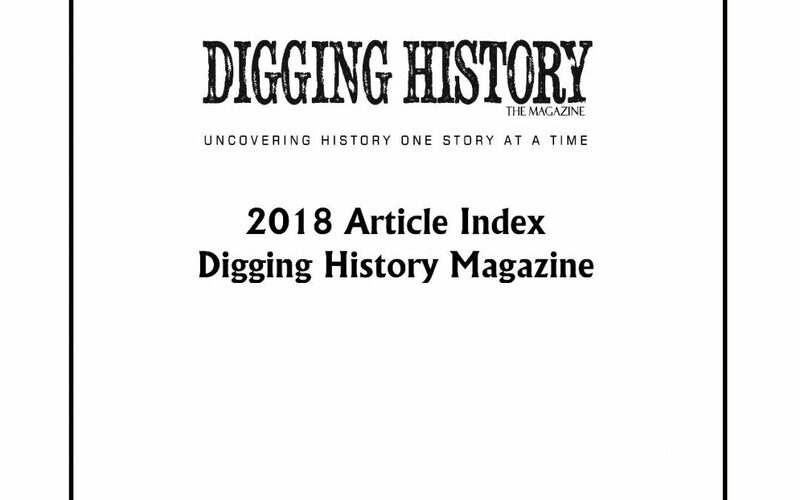 Digging History Magazine was launched in January 2018 and twelve issues were published last year. I decided to publish a free article index for anyone interested in taking a peek (all at once) at a list/synopsis of all articles. All 2018 issues are available for sale in the Magazine Store, some at reduced prices, along with the free article index. The Boston Molasses Flood of 1919: could it have been an omen for the volatile year ahead for America? Hell for Rent: A Nation Goes Dry: On January 16, 1919 Nebraska became the 36th state to ratify the 18th Amendment to the United States Consitition. One year later, King Alcohol would be dead – or would he? A bit of history on the temperance movement, including the outrageous tactics of one well-known “saloon smasher” who made a name for herself in the early twentieth century. Edith, Guess Who’s Coming to Dinner: Theodore Roosevelt unexpectedly became President of the United States in 1901, following the assassination attempt and death of President William McKinley. T.R. wasn’t too far into his presidency before a long-forgotten incident occurred. It seemed innocent enough at the time, but would generate a firestorm of criticism, especially from Southern Democrats who already didn’t trust him. The Life of James Clemens – From Slavery to Unspoken Greatness: This issue features a guest submission from one of the descendants of James Clemens, a freed slave who went on to participate in the Underground Railroad movement. His story still matters even today. Manumission: Free at Last (or perhaps not) – This extensive article explores the subject of manumission of slaves. A bit of history and stories of controversial manumissions (they all seemed to be controversial). Mathews v. Springer was a precedent-setting case in post-Civil War Mississippi. Free to Enslave? is a look at a few incidences of free persons of color owning slaves. One of the featured characters, William “April” Ellison, was at one time the largest slave owner in South Carolina, and a cruel one at that. Milly Pierce’s story is a bit more hopeful, but it’s a piece of African American history that sometimes gets overlooked. Jaybird-Woodpecker War: This long-running feud in Fort Bend County, Texas had nothing to do with birds of any feather – rather, it was an all-out race war which stretched into the 1950s. What’s in a Name? Sometimes you just have to do a little digging when something piques your curiosity. Such was the case with an unusual name given (Seawillow) to a girl born in the middle of a torrential rain storm in 1855. OK: Everything Has a History – even the word we use millions of times a day: O.K. It was part of a silly nineteenth century fad, but yet endured. America Waldo Bogle: It wasn’t easy being a person of color in Oregon Territory. America Waldo Bogle’s story is a story of perservering and succeeding despite racial tensions. Want to try an issue for free? On the right-hand side of this page, subscribe to the blog with your email address and a free issue will be on its way soon. The magazine is also available by subscription, and the best value. Three subscription options are available to fit any budget. Looking forward to researching and writing this year!